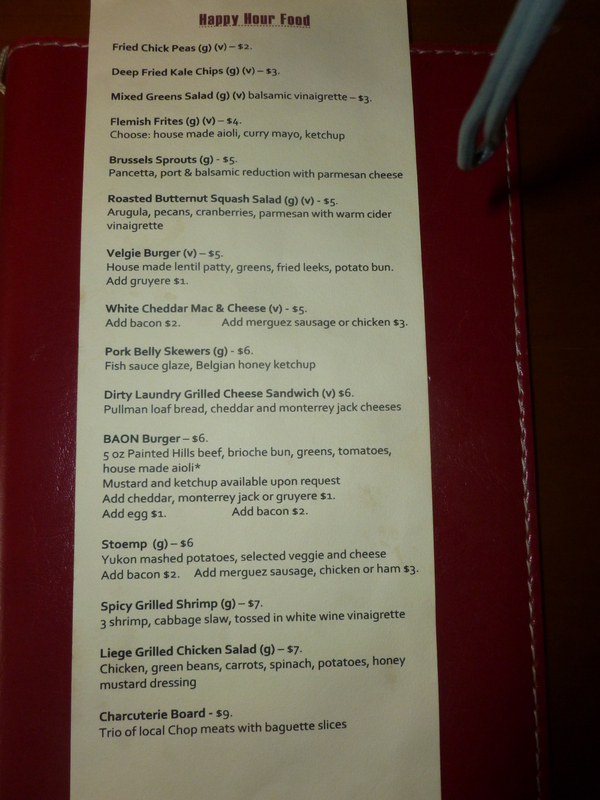 Bazi Bierbrasserie – More Than Just a Walk in the Park! 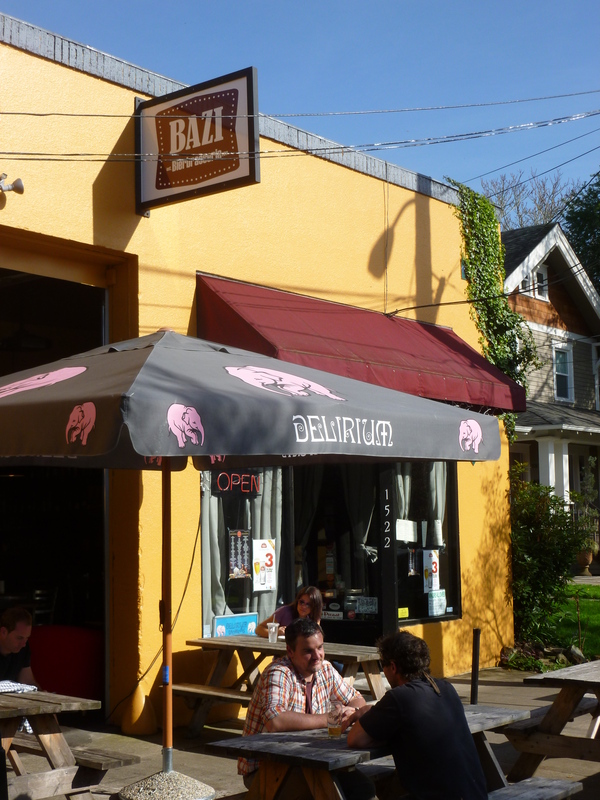 Bazi Bierbrasserie (Bazi) is another one of the select five Portland taverns which made Draft Magazine’s 100 Best Beer Bars in the USA for 2014. 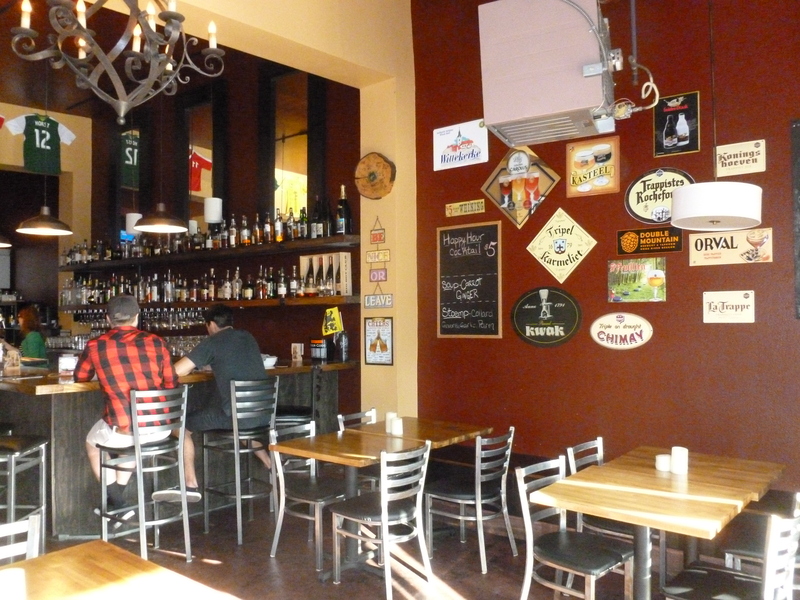 And Thebeerchaser has done reviews of two of the others in this list – Bailey’s Taproom (reviewed 4/13 – somewhat of a disappointment) and Saraveza (reviewed 3/14). Bazi was a definite favorite with our group, which included Roy Lambert, Mary Maxwell, David and Kate Dickson and Janet, Thebeerchaser’s spouse. We typically take a walk before eating and drinking – a great way to get exercise and mitigate the guilt from partaking in pub faire. 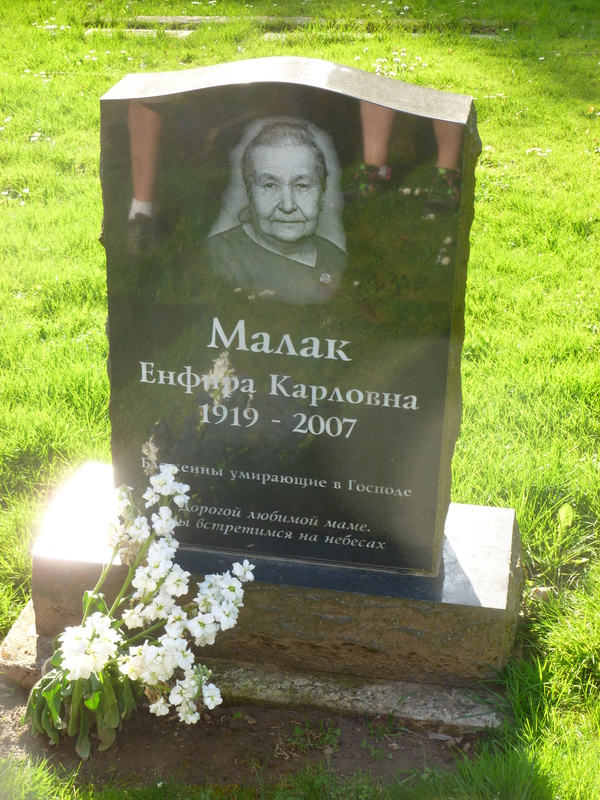 And Mary, who prior to retirement in 2009 was the Director of Aviation for the Port of Portland, demonstrated her superior planning skills by charting a superb 2.5 mile walk through the Lone Fir Cemetery and Laurelhurst Park on a rare, beautiful spring day. 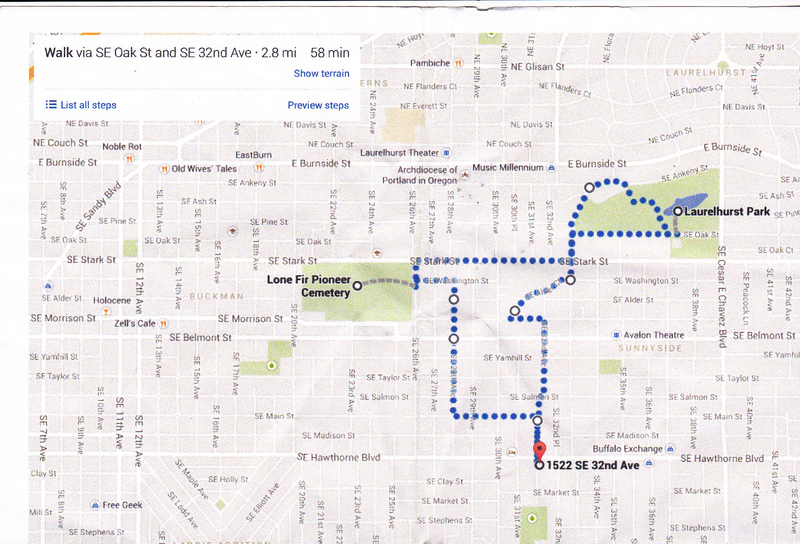 Perhaps this should be labeled “The Beer Walk”…. 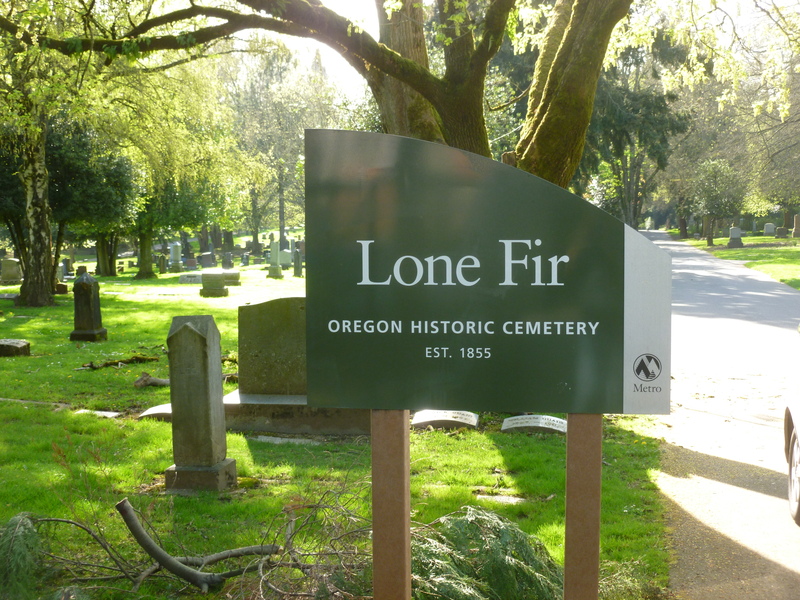 Strolling through the Lone Fir was very interesting and we learned about the ties with Portland’s Russian community – as evidenced by many of the family plots with pictures engraved in the stone monuments. 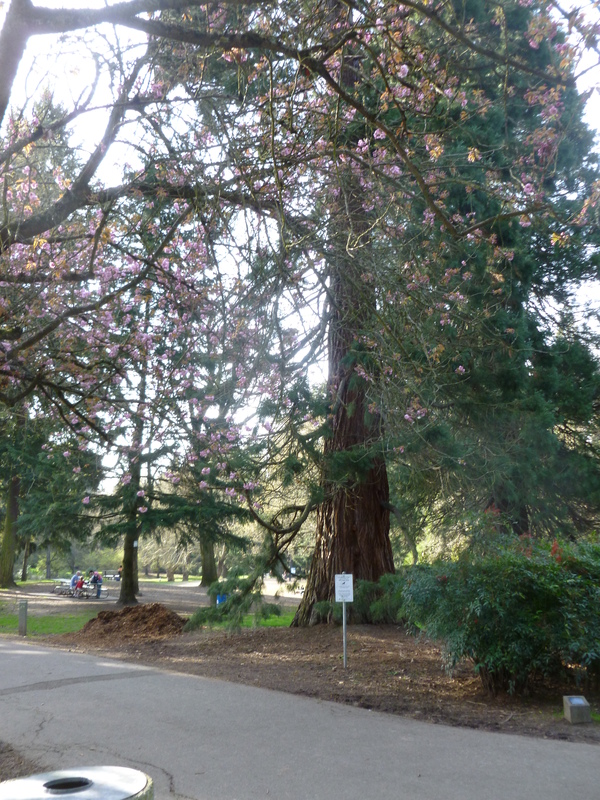 We then walked through Laurelhurst Park, which on one of the first nice days in many moons, teemed with people and activity. 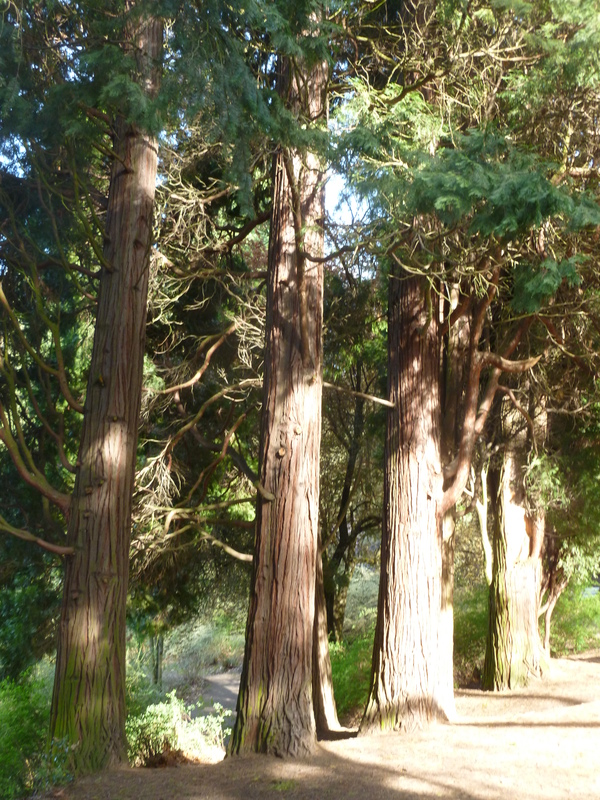 The 27 acre park was purchased by the City of Portland in 2011, and in 1919, the Pacific Coast Parks Association named it the “most beautiful park” on the West Coast. It was also the first city park ever to be listed on the National Register of Historic Places. 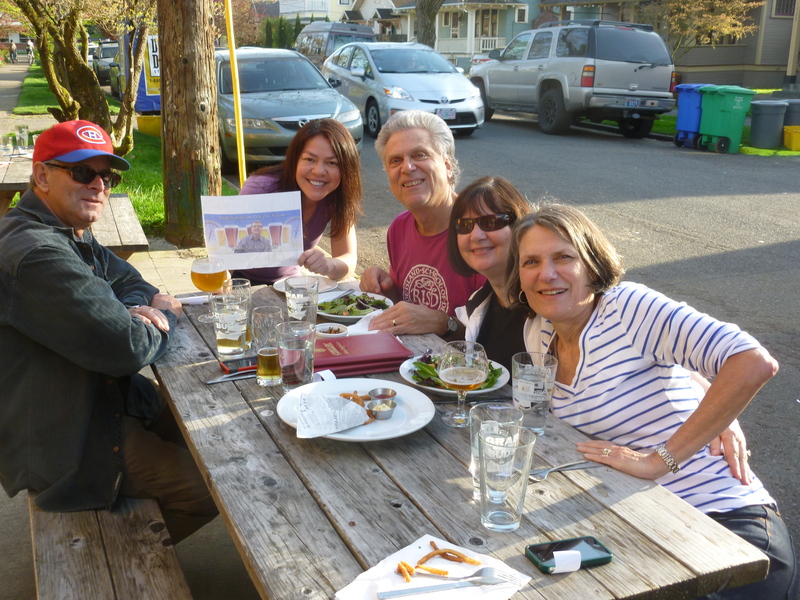 Although the walk was great, the biggest treat was still to come – drinks and great food at Bazi. And it was evident by the total experience why this bar made Draft’s Top 100 list. 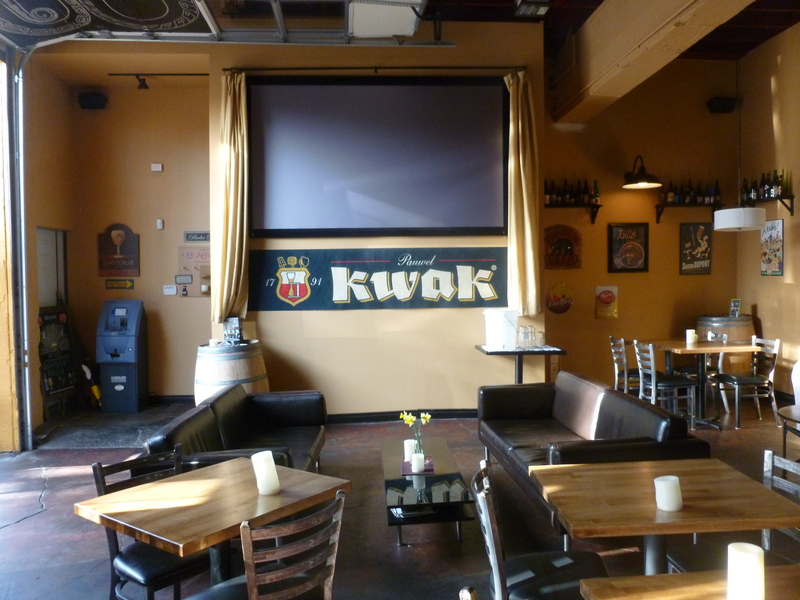 A great place to watch Timber (or Blazer games. 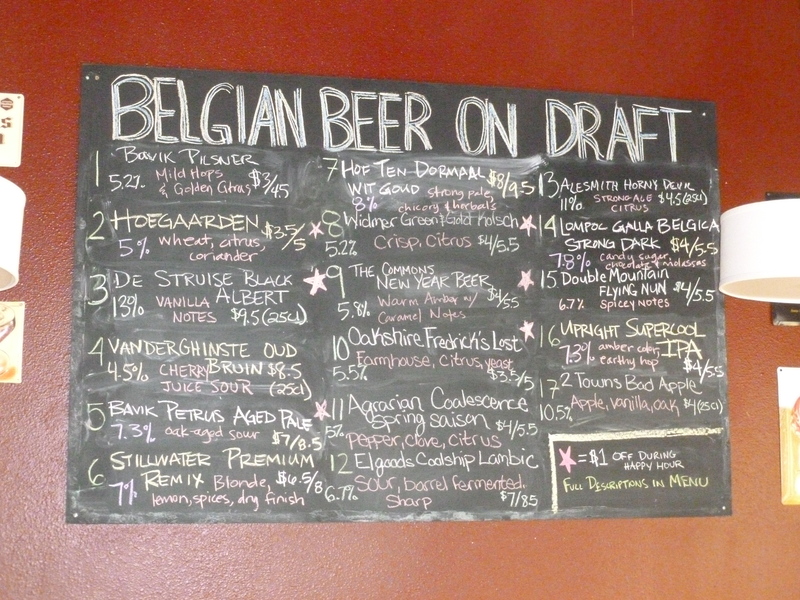 An extensive selection of Belgian beers. One of the distinguishing features for Bazi is its management – Hilda Stevens is the owner. I was surprised to find while researching before my visit that she responded to many comments from sites such as Yelp and Trip Advisor – most notably, the critical ones – which often times are really trite and unwarranted. Hilda, the owner, (holding the logo) with our group. “Thanks for taking the time to write. Can you let me know when you visited recently that you experienced slow service?…. I have to admit, given the ongoing success of the bar, which opened in May, 2011, and was an immediate hit and the moniker, “Hilda,” I was expecting the proprietor to be a much older person. When we chatted with her, however, we met a delightful, young entrepreneur, who was raised and went to college in Texas. She traveled extensively in Europe and did a bunch of research – most notably on Belgian beers. She completed her Masters’ Degree at Oregon’s George Fox University and developed a smart business plan – to specialize in Belgian beers – and capitalize on service and quality – this was evident. The bar at Bazi 1906 reclaimed wood from the Jim Beam distillery in Lexington, Kentucky! 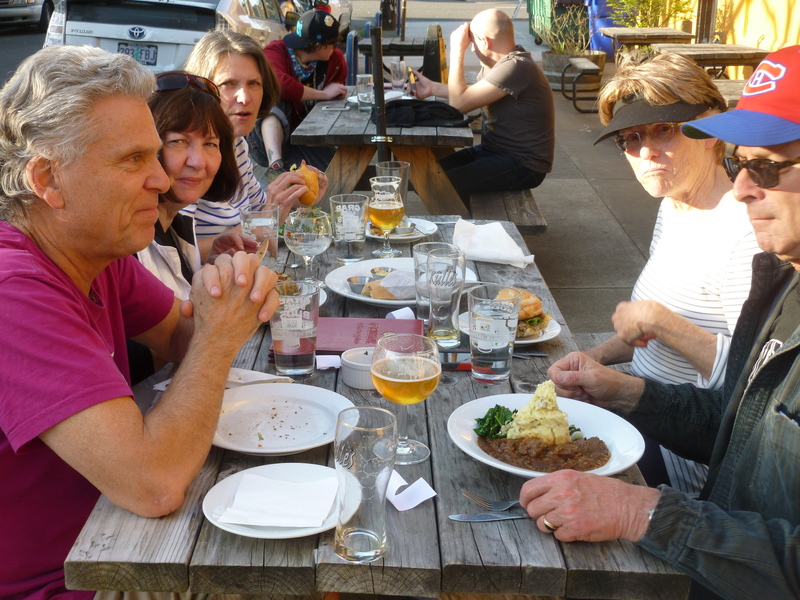 Our server, Sydney, was also very knowledgeable and offered specific and detailed comments on several of the seventeen beers on tap, which helped in our selection – we tried a few including Oakshire Frederic’s Lost Arm Farmhouse Ale and the Bavik Premium Pilsner – all very good. Given the outstanding line-up of handcrafted cocktails, Thebeerchaser also tried the $5 Happy Hour Cocktail which that day was “Sleepless in Oostende” (Jim Beam, lemon and orange juice and orange bitters.) The cocktails are named after Belgian cities. Oostende is a Belgian city located in the Flemish province of West Flanders. The “sleepless” reference might result from worry that the series of the dikes that keep the North Sea from flooding this town would fail. Or perhaps it is in recognition of the City’s guards during The Siege of Oostende (1601 -1604) of which it was said that “the Spanish assailed the unassailable and the Dutch defended the indefensible” (Wikipedia). The siege resulted in 80,000 combined casualties – the single bloodiest battle of the Eighty Years’ War. 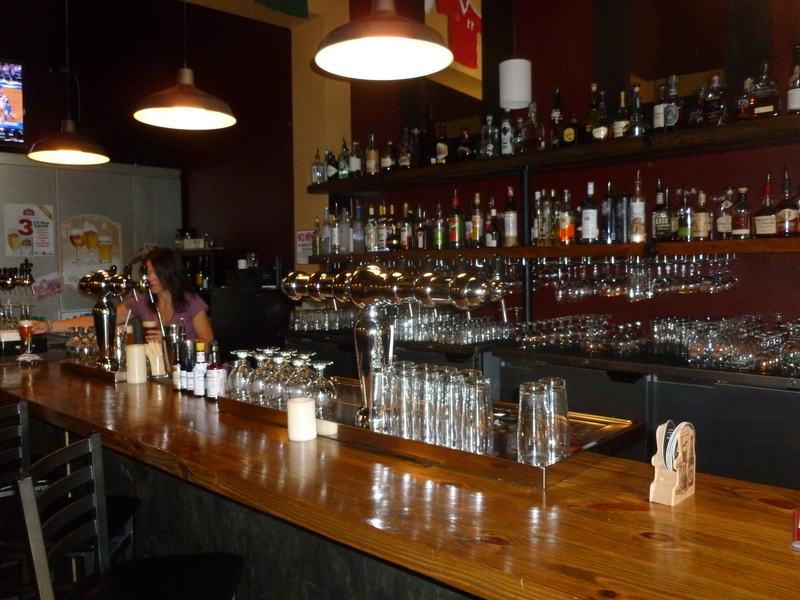 Bazi also has an extensive list of bottled beers and ciders, a nice wine selection, a bunch of hard liquor selections you can get by the shot, and you can also fill your growler. You can see from the picture that they have a robust Happy Hour menu. The Baon burger, fried chick peas, brussels sprouts, veggie burger and most notably, the Stoemp (Yukon mashed-potatoes and veggies) were all scrumptious. Great food – made from scratch…. 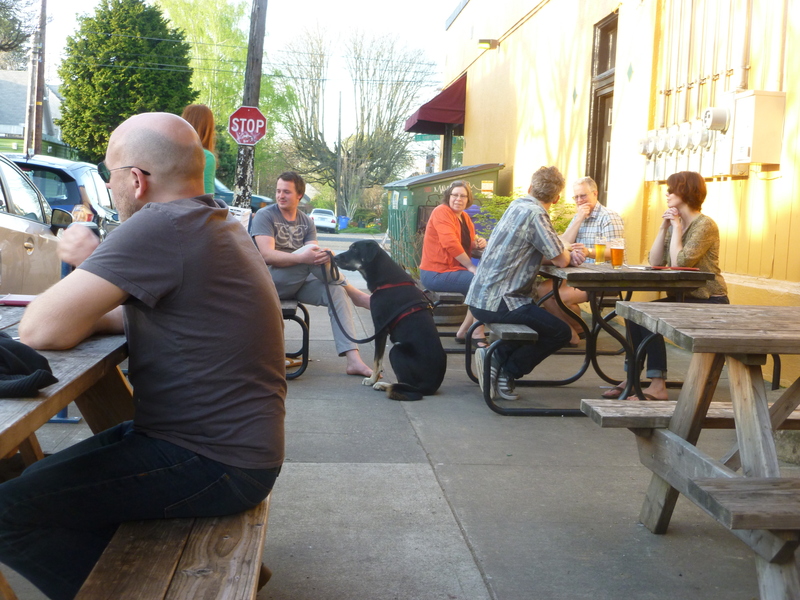 The patio was full that day and it was obvious that it was both dog and family friendly. And when you visit Bazi, try a walk in the park and a stroll through the burial grounds – it’s a hike with a plot! This entry was posted in Neighborhood Bars, Uncategorized and tagged Bailey's Tap Room, Bavik Premium Pilsner, Bazi Bierbrassiere, Belmont Station, Draft Magazine 100 Best Beer Bars, George Fox University, Hilda Gardiner owner of Bazi, Horse Brass Pub, Laurelhurst Park, Lone Fir Cemetary, Mary Maxwell Director of Aviation for Port of Portland, National Register of Historic Places, Oakshire Frederic's Lost Arm Farmhouse Ale, Pacific Coast Parks Association, Portland Barfly, Saraveza, The Siege of Oostenende, Thebeerchaser tour of Portland bars taverns and pubs by thebeerchaser. Bookmark the permalink. I sent him the link to your site, too. It’s a beer morning! Thanks Molly. Portland has so many hidden treasures and Thebeerchaser Tour has been a way to find some of them. 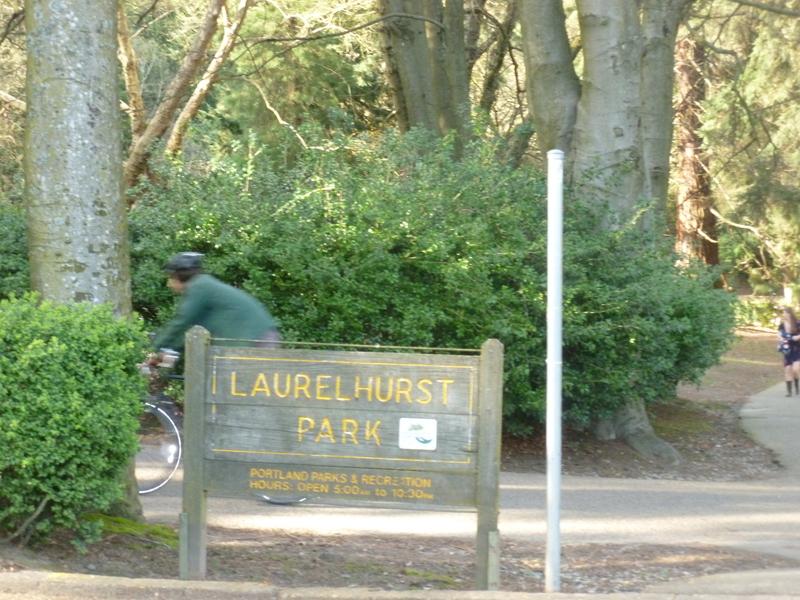 I had never been to Lone Fir or Laurelhurst Park before. Thanks for intro to David. I signed up as a follower of his blog which looked very interesting. You can thank Molly for the introduction! Thanks David. I signed up for your blog which looked very interesting. Thanks Don. I’m looking forward to your beer chasing around town. Always interested in new options. I was especially interested in your revealing the secret to the space upstairs at Bailey’s. We were eating at Saucebox last month, and happened to look up at the windows, and were very curious about what was going on. We’ll definitely have to try it since we can never seem to stumble into Bailey’s when there is a seat! Don, I like your site but think you left out the two best breweries in NE Oregon, if not the state. You need to stop for a while at Barley Brown’s in Baker City. I don’t know of any other breweries, anywhere that have earned as many medals at the GABF for the amounts they brew than Barley Brown’s. Their beer is unbelievably good. It’s also pretty hard to beat drinking a beer at Terminal Gravity’s public house in Enterprise when the weather is nice (their beer is pretty good as well). BTW, next time you come to Baker, look me up and I can introduce to another former Kilpatricks’ lawyer and son in law of Roy. Thanks for your comments and I have an explanation. We got to Baker City early in the morning and went by Barley Brown’s, but it was not open. In fact, we had to wait a few minutes before the Bull Ridge Brewery opened in the morning and were the first people in the door. Next time I’m in Eastern Oregon, I will definitely go there and also look you up. And my wife and I did visit the Terminal Gravity brewery in Enterprise on the trip we took to Joseph (see post on the Embers Brew Pub). We had some delicious Mac & Cheese and bought some beer to go. Hey, Beerchaser, I know you are all seeing when it comes to beer related things, but I wanted to be sure that you were aware of this cultural opportunity. Thanks Dan. Thebeerchaser is always interesting in mitigating the stereotypical image of beer drinkers being frat boys without manners or couth. This program is consistent with the objectives of this blog and one which enhances the culture of the Rose City – I will drink to that! Great walk, wonderful food and delightful company. Thanks, don!! You are correct – especially on the “great company,” part of that comment. Am anxious to hear about what watering holes you hit on your Eastern Oregon road trip.